There are environments and situations that make your energy tough to contain; places and events where it&apos;s nearly impossible to keep your body still. Bringing in stellar touring and local musical acts, Lincoln Theatre in downtown Raleigh (126 E. Cabarrus St.) happens to offer one of these environments. Especially when the venue brings in entertaining, high-energy bands like ska punk rockers Less Than Jake like they did Wed. night! 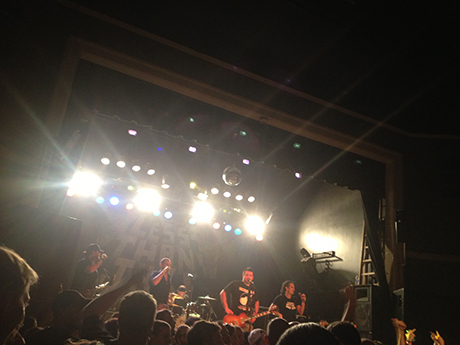 I&apos;d seen Less Than Jake on tour a few years ago at another venue, but as we say here at visitRaleigh, "Sometimes it&apos;s not just about what music you&apos;re listening to, it&apos;s about where you&apos;re at while you&apos;re listening." I was pumped to see the band up close and personal at Lincoln Theatre, and especially in downtown Raleigh. I knew the doors were officially going to open at 7pm, so I arrived at about 5:30pm. At Lincoln Theatre concerts, or general-admission concerts anywhere in Greater Raleigh, I&apos;d always suggest that you get your ticket early and arrive early so you can land a spot in the front of the "waiting-for-the-doors-to-open line." That way, when the venue lets you in, you have the option of snagging a great spot and getting your favorite view of the stage (at the front of the stage, middle or in the back to take in the panoramic view). If you get there even earlier, and I&apos;m talking way before the line starts to form, fuel up with downtown restaurants right around the corner. I arrived early and I was about number 20 to walk through the doors when they opened at 7pm. For a Music Maniac, walking through that venue door and officially being set for a night of music is a great feeling. My ticket was scanned, and I walked through the main entrance room where Less Than Jake and the two bands on tour with them (Pentimento and Hostage Calm) had merchandise displays lining the wall. The local band opening up the show, a highly entertaining punk rock band called Almost People, had a table with merchandise as well. 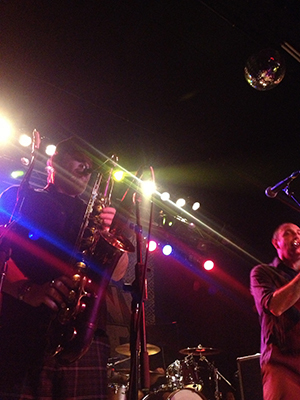 The floor: You can get right in front of the stage and jump around with the crowd to bands like Less Than Jake. Tiered levels behind the floor: You can get a wide view of the stage here, and if you&apos;re short in height like I am, you can see above people&apos;s heads! Balcony-level: Open during select shows, this offers a really cool overhead view of the stage (and it&apos;s pretty entertaining to look down on the floor-level crowd when dance parties break out). 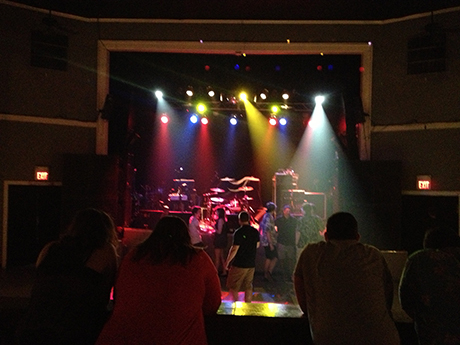 Snagging my spot in front of the stage, I observed the "awesomeness" that is the sound system at Lincoln Theatre. If you&apos;re a sound techie, you might be interested in this: check out the technical specs here! On one of the tiered levels, you can even look back and catch a glimpse of the sound booth. When the first out of the three punk rock opening acts cranked up, you could feel the sub woofer in your chest (a feeling that&apos;s welcomed and adored by many Music Maniacs). Being right up at the stage, I was not only able to hear the powerful sound system, but I could also hear the onstage sound. It was especially great because one of the guitarists from the band Hostage Calm had a Vox head and an Orange cabinet. The tone was crisp, crunchy and delightful. That brings me to another tip: If you check out a rock show at Lincoln Theatre, or any venue in Greater Raleigh, have some ear plugs on hand. That way, if the music is too loud for your taste, you can take in the show right up front more comfortably. And more importantly, you can protect your hearing. So back to that environment and situation where you can&apos;t contain your energy: As the first bands played, you could feel an urge to move. Heads bobbed and the crowd jumped higher and higher as the night went on. Almost People, Pentimento and Hostage Calm all fed the excitement of the night with high-energy punk rock originals. Hostage Calm even played a polished cover of Billy Idol&apos;s "Dancing with Myself," which the crowd went crazy for. At that moment especially, there was absolutely no restraining the crowd&apos;s urge to dance. Finally, the moment the crowd had been waiting for came. 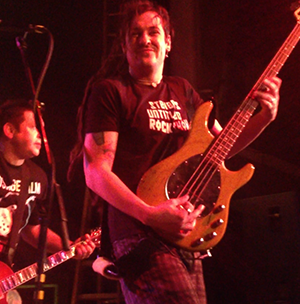 Less Than Jake&apos;s large band banner rose and back-lined the stage, and soon the band stormed the stage. The positivity and "fun factor" of the band lit up the room and you could tell they were truly happy to perform. This celebration sparked the crowd to cheer louder and louder. The band consists of a saxophone player, a trombone player, a vocalist/guitarist, a vocalist/bassist and drummer, and they definitely took full advantage of the spacious stage by running back and forth and jamming. With the combination of the slick tones of the horns, the round bass tones, the deep bass drum kick and tight snare and the full sound of the guitar, I couldn&apos;t get enough of the sound. The band was truly fun and entertaining. 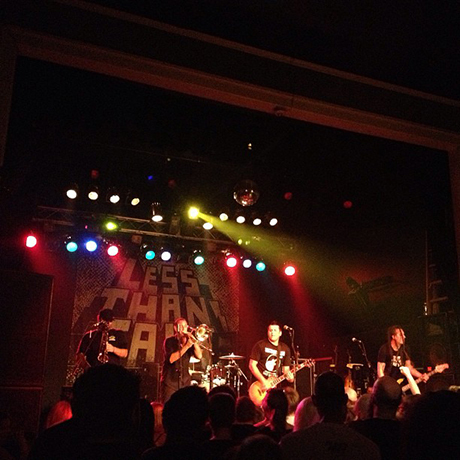 New and old, the songs Less Than Jake played almost forced everyone to move in the venue. Singer/guitarist Chris DeMakes said at one point, "You guys came out in droves tonight!" This was a much anticipated show for fans. Seeing the band at Lincoln Theatre was especially great. 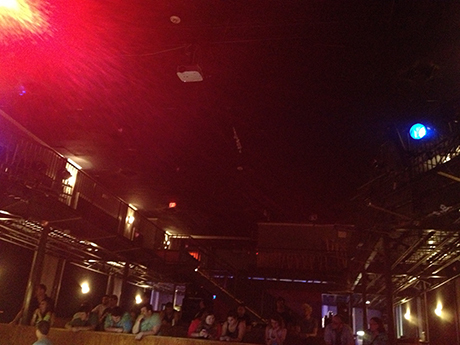 With the whole atmosphere of the venue, I really felt like I was hanging out with the band. Several times, vocalist/bassist Roger Manganelli came to the side of the stage where I was and rocked out with my side of the crowd. After a good number of songs, I moved back to get a wide view of the stage. It was pretty fun watching the crowd going wild in the center of the floor. At one point, DeMakes requested for the flood lights at the venue to be turned on. The light engulfed the crowd and it was great to see how many people were smiling, laughing and having an exceptional night. The night came to an end after Less Than Jake&apos;s close-to-two-hour set, and it was such an entertaining and captivating set that it felt much longer. It&apos;s easy to get lost in the music when its energy and sound surrounds you. If you&apos;ve never been able to catch a show at Lincoln Theatre, I highly recommend it. The venue hosts shows featuring different genres year round, and brings on talented local and touring bands. So if punk rock is not your favorite, there are still plenty of shows to take in. After all, Greater Raleigh does offer more live music than any other destination in North Carolina. Check out Lincoln Theatre upcoming shows here, and enjoy a summer of wall-to-wall live music in Greater Raleigh.